It can be seen that the drift is in the azimuthal direction. A positive drift velocity corresponds to eastward motion, whereas a negative velocity corresponds to westward motion. It follows that, in addition to their gyromotion, and their periodic bouncing motion along field-lines, charged particles trapped in the magnetosphere also slowly precess around the Earth. The ions drift westwards and the electrons drift eastwards, giving rise to a net westward current circulating around the Earth. This current is known as the ring current. Although the perturbations to the Earth's magnetic field induced by the ring current are small, they are still detectable. In fact, the ring current causes a slight reduction in the Earth's magnetic field in equatorial regions. The size of this reduction is a good measure of the number of charged particles contained in the Van Allen belts. During the development of so-called geomagnetic storms, charged particles are injected into the Van Allen belts from the outer magnetosphere, giving rise to a sharp increase in the ring current, and a corresponding decrease in the Earth's equatorial magnetic field. These particles eventually precipitate out of the magnetosphere into the upper atmosphere at high terrestrial latitudes, giving rise to intense auroral activity, serious interference in electromagnetic communications, and, in extreme cases, disruption of electric power grids. The reduction in the Earth's magnetic field induced by the ring current is measured by the so-called Dst index, which is determined from hourly averages of the northward horizontal component of the terrestrial magnetic field recorded at four low-latitude observatories: Honolulu (Hawaii), San Juan (Puerto Rico), Hermanus (South Africa), and Kakioka (Japan). Figure 2.3 shows the Dst index for the month of March 1989. The very marked reduction in the index, centered on March 13, corresponds to one of the most severe geomagnetic storms experienced in recent decades. In fact, this particular storm was so severe that it tripped out the whole Hydro Québec electric distribution system, plunging more than 6 million customers into darkness. Most of Hydro Québec's neighboring systems in the United States came uncomfortably close to experiencing the same cascading power outage scenario. Incidentally, a reduction in the Dst index by 600nT corresponds to a 2 percent reduction in the terrestrial magnetic field at the equator. Figure: Dst data for March 1989 showing an exceptionally severe geomagnetic storm on March 13. 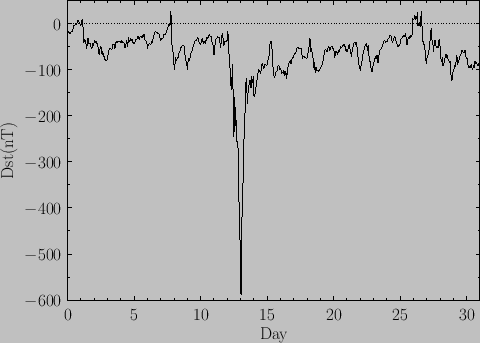 Raw data from World Data Center for Geomagnetism, Kyoto. Note that MeV energy electrons and ions precess around the Earth with about the same velocity, only in opposite directions, because there is no explicit mass dependence in Equation (2.112). It typically takes an hour to perform a full circuit. The drift period only depends weakly on the equatorial pitch angle, as is the case for the bounce period. Somewhat paradoxically, the drift period is shorter on more distant -shells. Of course, charged particles only get a chance to complete a full circuit around the Earth if the inner magnetosphere remains quiescent on timescales of order an hour. This is, by no means, always the case. Finally, because the rest mass of an electron is MeV, many of the previous formulae require relativistic correction when applied to MeV energy electrons. Fortunately, however, there is no such problem for protons, whose rest mass energy is GeV.